What Is The Abbott Walkabout? | Home | What Is The Abbott Walkabout? What Is The Abbott Walkabout? In Two Minutes, You WIll Know! Is your operation ready in need of a turnaround. Reducing cost while simultaneously improving quality and customer satisfaction is the objective. If you are ready to turn your operation around, give me a call at 864-297-9598. An effective operation must be built on a foundation of science and principles. 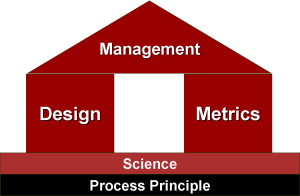 With this foundation there are three knowledge areas: design, metrics, and management. The key to an effective operation is the minimization of variability or Sigma. Designing and managing to reduce variability is called a Six Sigma Program. Design is built for simple operation and minimal variation. Metrics provides the eyes and ears for effective decisions. Management will dynamically exert control over the operation. The products and services that businesses provide are changing dramatically; over the last several decades, the pace of this change has increased in dramatic proportions. Many companies are attempting to organize and run their business like it was 10 years ago or 20 or even 30 ago. New and more effective tools are required to keep up. These tools apply to all operations and must be based on good solid principles and science that form a solid foundation. Your Resource for developing and teaching these science based methods. ©2019 What Is The Abbott Walkabout?. All Rights Reserved.